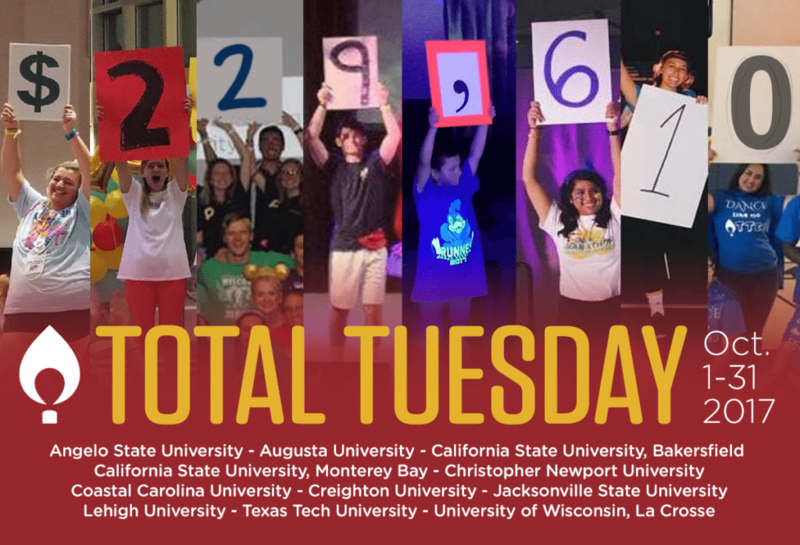 During the month of October, 11 colleges and universities from across the United States hosted their Miracle Network Dance Marathon events, helping to raise over $229,610 for local Children’s Miracle Network Hospitals. So far in 2017, Miracle Network Dance Marathon programs have raised over $30.4 million, which is approximately a 20% increase over 2016 fundraising at this point in the year. On Oct. 25, Angelo State Dance Marathon hosted their second annual event and announced their fundraising total of $3,520.46, a 119% increase over their 2016 fundraising! Their fundraising benefits Shannon Medical Center in San Angelo, Texas. Jaguar Miracle at Augusta University announced their fundraising total of $17,685.53 at the end of their Dance Marathon on Oct. 20. This total is a 5.5% increase over their 2016 fundraising total and will benefit Children’s Hospital of Georgia in Augusta, Ga. Miracle Network Runner DM at CSUB more than tripled their 2016 fundraising total by raising $9,348 in 2017 for the kids at Lauren Small Children’s Center in Bakersfield, Calif.
California State University Dance Marathon hosted their inaugural event on Oct. 13 and raised $3,000 for Salinas Valley Memorial Hospital in Salinas, Calif.
We want to thank everyone who came out and supported without all of you this wouldn't have been possible. You can still continue to donate through our link the fight is not over! CaptaTHON at Christopher Newport University announced their 2017 fundraising total of $20,338.58 at their annual Dance Marathon event on Oct. 27. Their fundraising total is a 59% increase over their 2016 total and benefits Children’s Hospital of the King’s Daughters in Norfolk, Va.
Coastal Carolina University Dance Marathon increased their fundraising by 55% over their 2016 total, raising $34,370 in 2017 for McLeod Children’s Hospital in Florence, S.C. In honor of the 62 children who enter a Children’s Miracle Network Hospital every minute, Creighton Dance Marathon set a goal to raise $62,000 in 2017. By the end of their Dance Marathon on Oct. 28, the students celebrated their total of $68,002.17 for Children’s Hospital & Medical Center in Omaha, Neb. Jacksonville State University’s inaugural Dance Marathon event was hosted by the local Phi Mu chapter on Oct. 14 and raised $13,369.59 for Children’s of Alabama in Birmingham, Ala.
At their event on Oct. 21, Lehigh University Dance Marathon announced their 2017 fundraising total of $40,975.40 for Children’s Hospital of Philadelphia. Texas Tech University Raiderthon hosted their Dance Marathon event on Oct. 28 and raised $7,441 for UMC Children’s Hospital in Lubbock, TX. In their inaugural year, EagleTHON at the University of Wisconsin-La Crosse raised $11,403.89 for Gunderson Health System, which they celebrated at their Dance Marathon event on Oct. 14. Next post: How Badly Do You Want LSU to Beat Bama?